An afternoon out in Greenwich to do a bit of Christmas shopping and also visit the Cutty Sark (the pub, not the ship). At Herons Quay DLR station (pretty much next door to Canary Wharf station). We thought as we were here we should take a stroll up to the observatory. Chie on the meridian line. Recently whenever I have cheap looking carrier bags I feel a bit like Angelos Epithimou from Shooting Stars. I feel like I may have gone a bit overboard with this attempt at an impression. Canary Wharf seen through some of the naval college buildings. Canary Wharf across the water from outside the Cutty Sark. In the Canary Wharf shopping centre, which was very reminiscent of Japan. 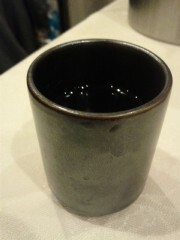 A cup of Shao Shing, Chinese rice wine, in Mr. Kong in Chinatown. Our dinner at Mr. Kong.